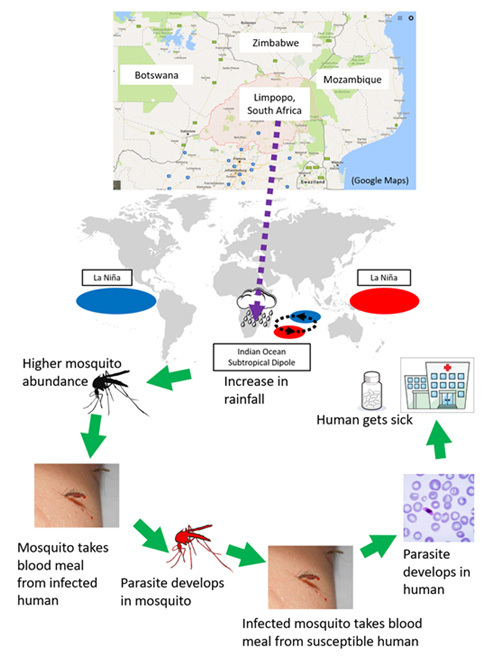 Investigations on association between malaria incidence and spatio-temporal climate variations in Limpopo, the northernmost province of South Africa, suggested that climate anomalies in tropical Pacific and the southern Indian Ocean bring changes in precipitation and temperature in South Africa, which would affect malaria incidence rates a few months later, according to a research led by Takayoshi Ikeda at the Application Laboratory of Japan Agency for Marine-Earth Science and Technology (JAMSTEC: Asahiko Taira, President) and Professor Noboru Minakawa at Nagasaki University. The project has been carried out in cooperation with the Japan Agency for Medical Research and Development (AMED), and Japan International Cooperation Agency (JICA) as a project for Science and Technology Research Partnership for Sustainable Development (SATREPS). In South Africa, epidemics of infectious diseases, such as malaria, cholera and pneumonia are threatening people’s health. In Limpopo, malaria is most prevalent during the local rainy season (from September to May). However, the spatio-temporal distribution of malaria, and its relationship with climatic factors has yet to be fully understood. 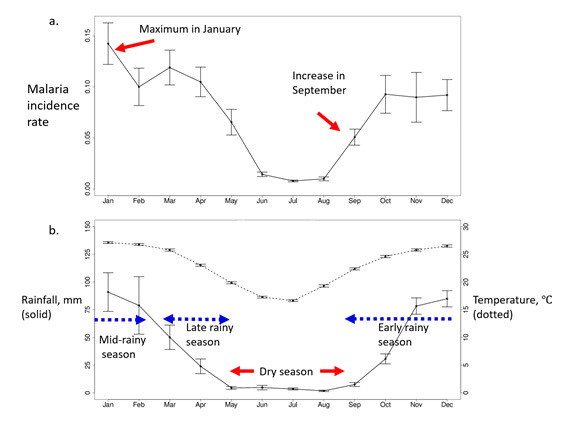 To test whether malaria incidence anomalies were associated with local and regional climate factors, and large-scale climate phenomena, the scientists investigated the relationship among monthly malaria incidence of Limpopo and temperature and precipitation at local and regional scales, and sea surface temperature (SST) at a global scale. Their analysis found significant associations among incidence rate anomalies and climate patterns. A high incidence of malaria during the pre-peak rainy season (Sep-Nov) was associated with the climate phenomenon La Niña and cooler than normal air temperatures over southern Africa. There was also higher than normal precipitation over neighboring countries, two to six months prior to malaria incidences. 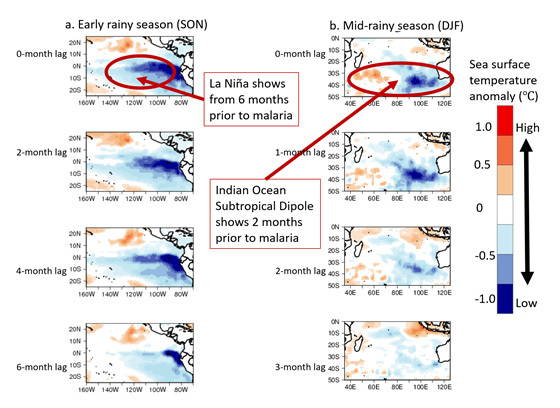 In contrast, during the peak rainy season (Dec-Feb), high incidence events were associated with positive phase of Indian Ocean Subtropical Dipole with warmer temperatures and higher precipitation than normal in neighboring countries observed two months prior to increased malaria incidences. Such a lagged association between climate and malaria incidence suggests that management plans for high-risk malaria areas should consider not only local climate patterns but those of neighboring countries as well. These findings highlight the need to strengthen cross-border control of malaria to minimize its spread. In addition, seasonal climate prediction in the region would help to build an early warning system of malaria epidemics several months prior to their outbreaks. This study project has been supported by SATREPS. The above results will be published in Scientific Reports on May 30, 2017 (18:00 JST). Figure 1. Divided into five municipal districts and subdivided into 25 local municipalities, Limpopo shares international borders with Mozambique, Zimbabwe and Botswana. La Niña or Indian Ocean Subtropical Dipole events will increase rainfall in South Africa, which leads to increased mosquito abundance. When a female mosquito takes a blood meal from an infected human, the parasite develops in the mosquito. Then, when the infected mosquito takes a blood meal from a susceptible human, he/she gets infected. The parasite then develops in the human, making him/her sick, and then requires medical treatment. Figure 2. a) Monthly mean and standard deviation of malaria incidence rate (% per 1000 person-years); b) Precipitation (mm: solid line) and mean temperature (°C: dashed line) in Limpopo for 1998 to 2014. Figure 3. 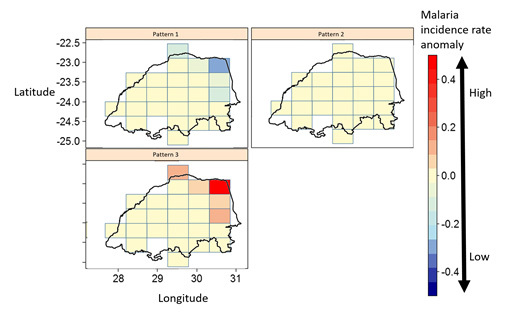 Self-organized map for malaria incidence rate anomalies in Limpopo with three patterns. Cells represent local municipalities of Limpopo. Higher variability of incidence rate than the average is observed in the northeastern part of the region. Figure 4. Composites of precipitation (mm: shaded), mean temperature (°C: contour), and wind (vector) in southern Africa for a) SON at 6-month lag, and b) DJF at 2-month lag. Differences in composite anomalies between the high and low malaria incidence years are shown here. Figure 5. Composites of SST (°C) in a) the tropical eastern Pacific for SON at 0-, 2-, 4-, and 6-month lags, and b) in the southern Indian Ocean for DJF at 0- to 3-month lags. Differences in composite anomalies between the high and low malaria incidence years are shown here.